Orthopaedics is the area of veterinary surgery and medicine that is related to bones and joints. 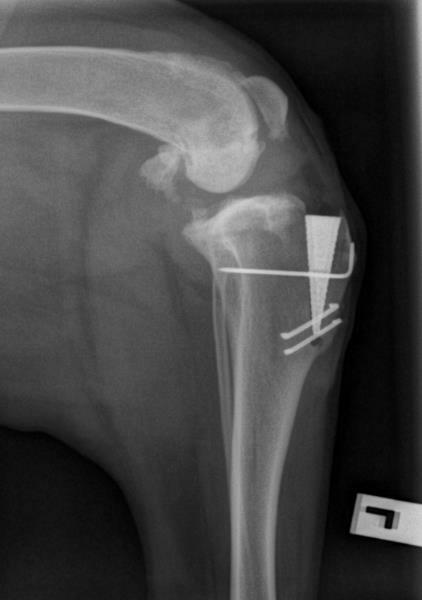 It includes treatment of fractures, ligament repairs, intervertebral disc disease (IVDD) and spinal surgery as well as management of inflammatory and degenerative conditions such as degenerative joint disease DJD (osteoarthritis), and developmental orthopaedic diseases like hip and elbow dysplasia and medial patella luxation (MPL). Our veterinarians' high levels of expertise and special interest training, combined with our practice's fully equipped surgical suite, allows us to perform many of these surgical orthopaedic procedures on site. CCL rupture, complete or partial, is the most common injury in the dog. It is also the most common cause of lameness in the dog. The treatment of CCL rupture is surgical. We perform both the Lateral Suture technique and the Modified Marquet Procedure (MMP) osteotomy wedge technique. MMP is a simplified version of Tibial Tuberosity Advancement procedure (TTA). It utilises a unique titanium foam (orthofoam) wedge shaped implant which replaces the complex plate and screw fixation seen in traditional TTA operations. The wedge provides robust early fixation without the need for support bandages or a lengthy rest period. MMP creates a solid repair which has the added advantage of considerably reducing convalescence and increasing the chances of the dog returning to a normal active life. Occasionally some cases of CCL, especially those in small breeds (less than 10kg body weight), can be managed medically. However if lameness recurs or worsens, then surgical options are indicated and should be considered. Fracture repair involves several orthopaedic techniques, utilising different implants, dependant on the bone or bones, involved and the type of fracture. Pins and wires, lag screws, external fixation and plates and screws are used for fractures of long bones found in the legs, the jaw, ribs, pelvis and spine. MPL is a degenerative condition often seen in small and bull breed dogs. The patella, or knee cap, moves out of its groove in the femur and sits on the medial (inside) of the stifle joint. While MPL in the early stages rarely causes severe lameness, it sets up a low grade arthritis within the stifle joint which can weaken other intra articulate structures such as the cruciate ligament. As the condition progresses, lameness can develop. Perhaps more importantly MPL can result in boney deformity, where the hind legs become bowed, due to the abnormal pull on the quadriceps muscle complex. MPL repair involves several aspects designed to replace and maintain the patella in the femoral groove, protect the cruciate ligament and ideally prevent or help correct any boney deformity. We offer pre-breeding screening for both hip and elbow dysplasia. Through responsible breeding of registered dogs and screening of potential breeding dogs, many breeds have been able to virtually eliminate these debilitating conditions. 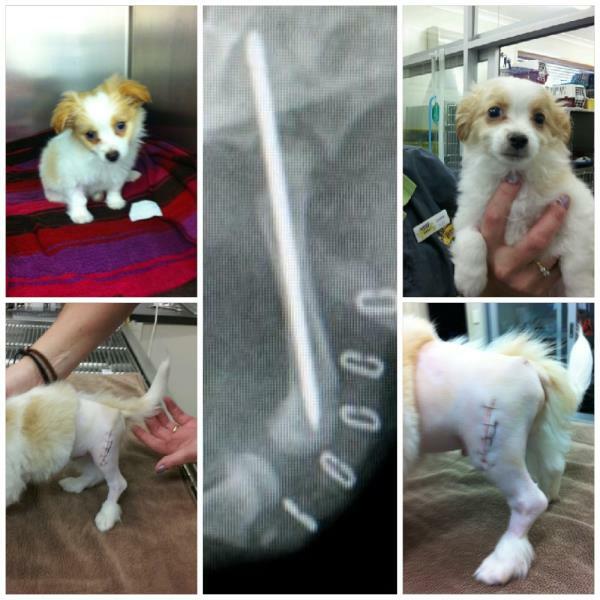 We also offer assessment and treatment options for dogs already affected. We hear commonly hear the comment "they're just getting old" "it's just arthritis, there's nothing we can do". Well actually there's an awful lot we can do for our older pets that develop DJD, or younger animals carrying a chronic injury. Arthritis can often be very successfully managed with a combination of weight management (this is THE most important aspect), prescription joint diets, dietary supplements, course of anti-arthritic injections and non-steroidal anti-inflammatory (NSAIDs) medication and a regular controlled exercise program. If you are concerned your pet may have arthritis, our veterinary team can examine and assess your pet, take radiographs (x-rays) if necessary, and work with you to develop a treatment plan specifically designed to keep your pet pain-free and as mobile as possible. Physiotherapy is essential in the post-operative period of many orthopaedic procedures, as well as in the management of chronic debilitating injuries. Maintaining muscle support around injured and repaired joints and bones and well as helping to build up muscle mass lost through injury can all be helped with extensive and regular physiotherapy sessions. Our veterinary nurses are trained in veterinary physiotherapy and are an essential part of our practice's orthopaedic work. Although most of the orthopaedic cases presented to our practice are treated in house, in some complicated cases we may recommend referral for further specialist, diagnostic work up such as CT (computer topography) or MRI (Magnetic Resonance Imaging) or even specific procedures best performed by a registered orthopaedic specialist. Our veterinary team works with several excellent Veterinary Specialist Centres in Melbourne and with the University of Melbourne's Veterinary Hospital in Werribee to ensure you are provided with the best advice for your pet.